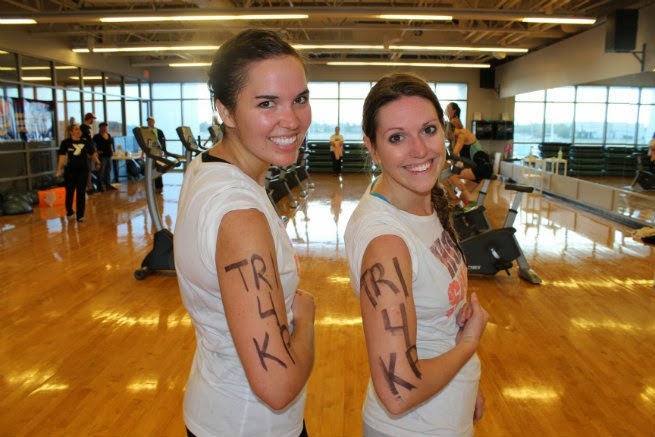 This past weekend Alisha and I competed in our 3rd indoor triathlon. I honestly love doing this race. The distances are much shorter than when I think of when they hear the word 'triathlon'. 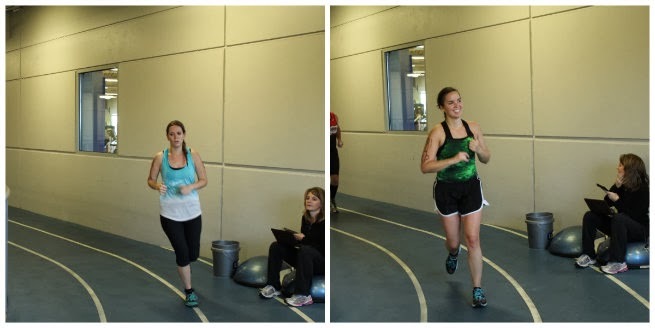 The race consisted of a 500m swim, a 6 mile stationary bike ride, and a 2 mile run. The cardio felt great! I told Dave it felt good to do cardio versus crossfit because I didn't feel like I got ran over by a train. I often feel like a big 'ole train ran right over me after crossfit. However, after this tri I felt so good! There's just something about a good cardio workout. I enjoyed this race for several other reasons too. First, it took place at the South YMCA in Wichita where I worked on and off for about 7 years (life guarding and membership services). 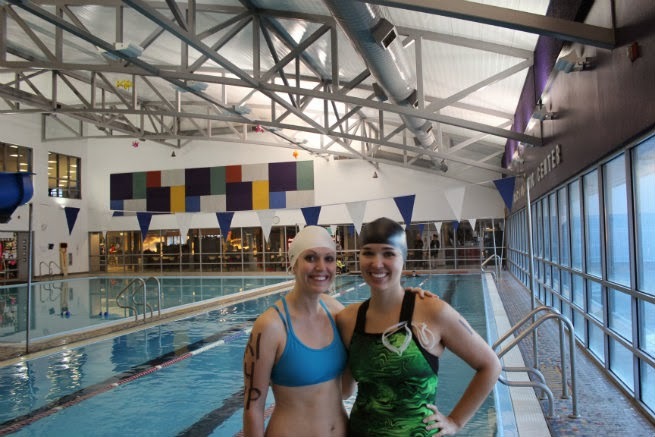 Second, I got to compete in a triathlon with one of my best friends, Alisha, and we always have a great time. Thirdly, we participated in this race in memory of our former boss. He was the director at the YMCA and came to cheer us on during our first triathlon. Within the year he passed away so now we do this race in memory of him. 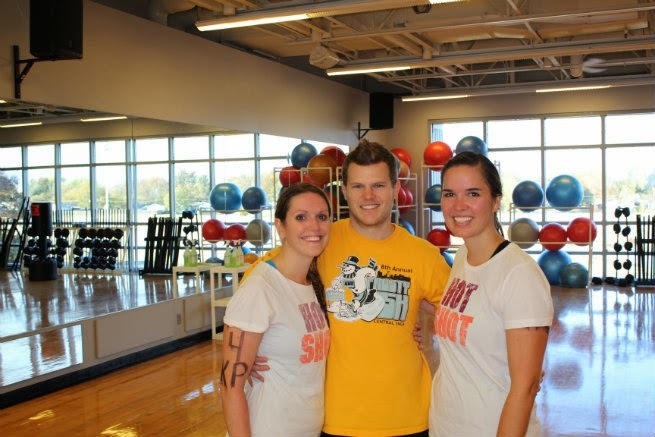 KP are his initials and we have 'hot shot' shirts because he used to call all us employees 'hot shots'. Here we are right before. Did I mention we had a start time of 7:20am? That's ridiculously early for Alisha and I. I mean, we could barely get our sleeping comatose bodies out of bed by 8:35am to go teach our Korean kids. Have I mentioned how much I don't like biking, yet? That's right! I said yet because I will learn to love biking and be faster! For now though, this picture tells all. Running! My favorite part of the traithlon. Remember how I was super clever and barely trained for that half marathon last month? Well, I'm here to report I've been awesome and haven't ran since then. However, I ran two miles in 19:07 minutes, which to me is decent for not running. Guess who got up super early to cheer us on and take pictures? Dave! He was a trooper. Mornings are not his favorite but he let me drag him out of bed at 6:30am on a Sunday. Thanks Dave!!! This race was very well organized and had some new features that I really enjoyed. During the race we had an electronic timer. When we ran on the track there was a large screen that told me my name and exactly how many laps I had ran. It mentally helped me to keep pushing. 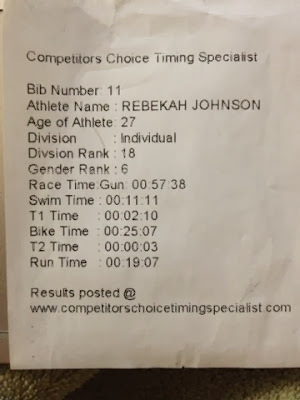 Also, after the race, there was a touch screen computer where I inputed my race number and it printed out my overall time, my split times, as well as my transition times. this looks like so much fun! biking kills my legs! This looks awesome! I never knew they did them indoors! Congrats on completing it...it always helps to have someone else with you during things like this. I ran (ok, jogged/walked!) my first 5k a couple years ago and invited several friends to join me. It definitely helped me keep going and was a distraction, too. And how sweet of Dave to be up early cheering you guys on- that's a good man! 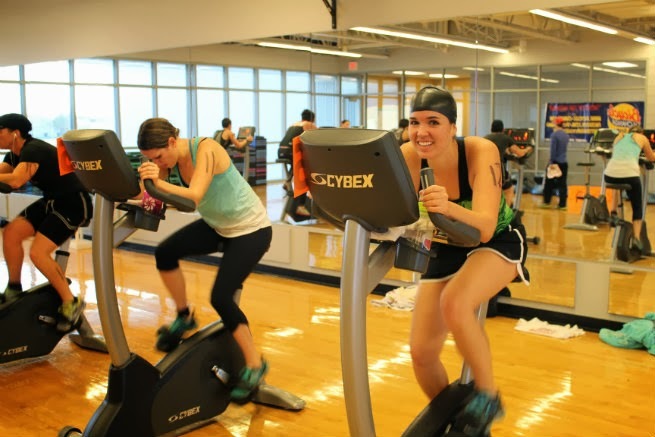 I did 2 of the YMCA triathlons this past spring and I love it too! I'm like you, the biking is the worst and hardest. For me, I just had to actually bike more in order to get faster as well as build up some muscle. I'm hoping to do one after baby #2 is here. I really enjoy training because it forces me to change my workout. Great job beka! I realized that I thought I've done four, because I have! I can't remember why, but you didn't do it in 2011. I did it with Dana that year. That was actually my fastest time, you know why? My run time was awesome for me (18:52) because that's the year we ran Seattle! That is really awesome! Congrats on completing your first tri. I think they are fun. I don't know if I will do another one this year just because we live in Oklahoma and have to drive 3+ hours for them. However, when I do, I'll up my resistance with my bike and see if that helps. I've actually never heard of anything like this. This sounds like the kind of tri I could handle. Looks fun too! Maybe I'll look into it. 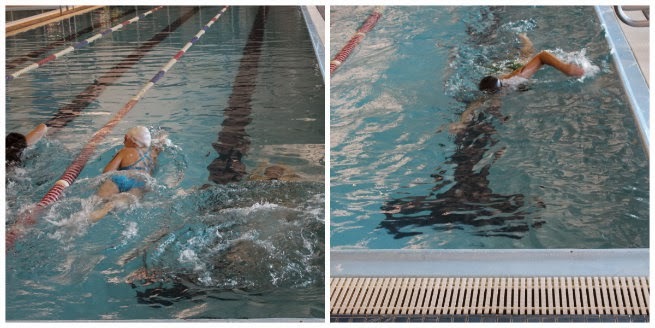 Of course, I'm not really a swimmer, so I'd have to practice that part.